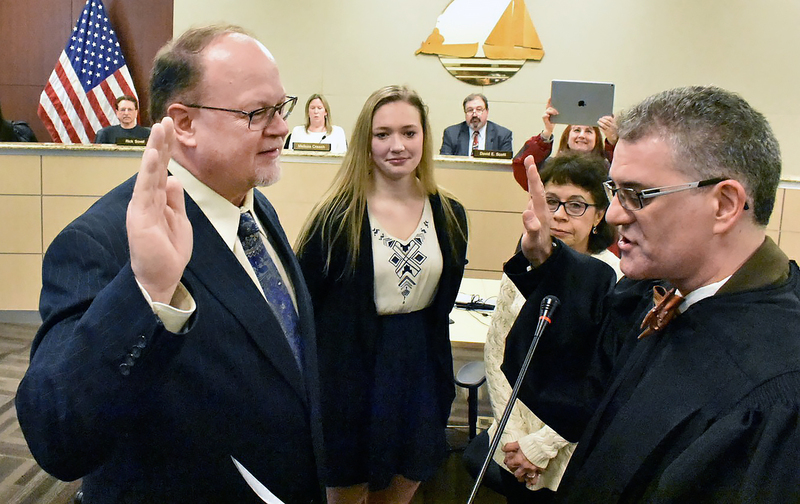 COMMERCE TOWNSHIP, Mich. — Sen. Jim Runestad was sworn in as senator for the 15th District Tuesday evening during a ceremony at the Commerce Township Hall. The Honorable Judge Michael Warren administered the oath of office. Runestad was joined at the ceremony by his wife Kathy and daughter Kayla. Editor’s note: The above photograph of Runestad is available by clicking on the image. It will soon be available at the senator’s website at www.SenatorJimRunestad.com/Photowire. Photographic credit for the use of this photograph must be given to Curtis Drogmiller. A video of the swearing-in will be available at www.SenatorJimRunestad.com/video. Photo caption: The Honorable Judge Michael Warren administers the oath of office to Sen. Jim Runestad, White Lake, (left) Tuesday evening during a ceremony at the Commerce Township Hall as Runestad is sworn in as senator for the 15th District. Runestad’s wife Kathy (right) and daughter Kaylalook on.